Get ready for a three-day Fourth of July holiday with numerous events set for Cannon and surrounding counties. The long-range forecast calls for a high of 88 degrees with mostly sunny skies on July 4 in Woodbury. Events kick off at 6 p.m. Thursday, July 3 with the Cannon Communities Fireworks Celebration at Woodbury’s Dillon Park sponsored by Cannon County, the Town of Woodbury and the City of Auburntown. The event is free with free food including hot dogs, soda, chips, water and watermelon. Participants are asked to bring non-perishable food items for the Emergency Food Bank. The event will open the ceremony with a flag ceremony and live music. Family games are planned with the fireworks beginning after it gets dark around 9 p.m. The Food Bank is requesting the following items: flour, sugar, cooking oil, powdered milk, instant potatoes, peaches, pinto beans, cream of chicken soup, cream of mushroom soup, canned meat items and peanut butter. Mooretown Fire Department will perform its annual fireworks show at 473 Hollow Springs Road on Friday, July 4. Grounds open at 4 pm, vendors will be set up, fireworks begin at dark. On Saturday, July 5, the Lions Club presents the Award Winning One Night Walking Horse Show at the Horse Show Arena in Woodbury. Gates open at 3 p.m., show starts at 5 p.m., enjoy top ranked walking horses, special classes and a show case appearance of “ I Am Jose”, voted 2013 Grand National Winner. 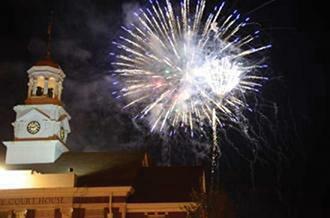 In Murfreesboro, the annual “Celebration Under the Stars” will be held at McKnight Park on July 4. The day’s activities begin at the outdoor pool at Sports*Com at 10 a.m. with a pool party, games and prizes until 4:30 p.m. The evening activities begin at 5 p.m. and admission is free. The Murfreesboro Symphony Orchestra, will present a program of traditional patriotic tunes and inspirational classics. The fireworks display by Pyro Shows will light up the sky at 9 p.m.
On Friday, July 4 and Saturday, July 5, it’s time for the 43rd Annual Smithville Fiddlers’ Jamboree and Crafts Festival. The Festival begins at 9 a.m. each day, and continues until the final competition has been awarded. With over 35 music and dance categories, streets full of hand-made crafts, and over a dozen food booths, there is something for everyone at the Jamboree. The mission of the Smithville Fiddlers’ Jamboree and Crafts Festival is to preserve and perpetuate traditional Appalachian and Old-Time music, dance, and crafts. Since its beginning in 1972, the old-time Smithville Fiddlers’ Jamboree and Crafts Festival has grown into a major event, drawing hundreds of musicians and crafts people, as well as many thousands of spectators from throughout the world. Nashville’s Riverfront Park is the venue for a continuous variety of bands and entertainers on several stages starting at noon on the fourth. At 9:30 p.m. , Music City’s Spectacular 4th of July Fireworks display will light up the Jefferson Street Bridge .